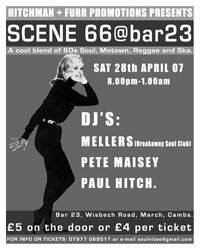 News of a new night in Cambridgeshire that kicks off in April – Scene 66. The launch date is April 28th at Bar23, Wishbech Road, March, Cambs, running from 8pm until 1am, admission is £5 on the door or £4 in advance if you get in contact via [email protected]. DJs on the night are: Mellers (from Breakaway Soul Club), Paul Hitch and Pete Maisey playing 60’s Soul, R&B, Motown and Ska in a cool venue with dancefloor, comfy chairs, bar and parking.